Laser hair removal allows you the freedom to stop shaving, waxing, plucking and pulling unwanted hair from your body. Laser hair removal is appropriate for men or women and most parts of the body. The procedure works best on patients with naturally dark, coarse hair and usually do not work with very light, or fine hair. Regardless of whether unwanted hair is due to a personal preference or is a source of shame, let Essentials Medispa and Salon help eradicate your unwanted hair! Laser hair removal is the process of using a pulsating laser beam to remove hair from your body permanently. It is non-invasive and performed by a licensed skin care expert. It is entirely safe for any healthy adult and is successfully on many areas of the body. During your procedure, our staff will hold a wand on your skin which contains a laser. When initiated, that laser beam will pass through your skin to the hair follicles. The light from the laser is absorbed by the melanin (or pigment) in the hair and converted to heat which damages the hair follicles. This damage makes future hair growth from that follicle difficult or impossible thereby leaving you hair free in that area. Although the procedure may sound painful, it is not. There may be some minor discomfort during the process which you should indicate to your skin care specialist. Redness or swelling of the treated area may be noticeable for the first few hours after the procedure. Ice or cooling gels may be recommended immediately after laser hair removal to reduce pain. Over the next days and weeks, you will begin to shed the hair from the treated area. Since hair has four stages of the growth cycle, you will need subsequent treatments to make sure you have addressed hair in each stage. Typically, a series of two to six treatments are required based upon the location of the area being treated. Ready to try laser hair removal? Stop fighting unwanted hair with messy and painful treatments. We have a better solution for you! We offer a convenient monthly payment plan that is interest-free to get you on your way to being hair free. Contact our office today to schedule your initial consultation for laser hair removal. We will perform our state-of-the-art laser technology on that pesky hair and leave you feeling pampered and ready to bare all. Our laser hair removal treatments come with a 2-year guarantee. If you are not entirely hair free within two years, your additional procedures are free. Essentials Medispa & Salon in Melbourne, FL serves patients in the Orlando and Central Florida area. 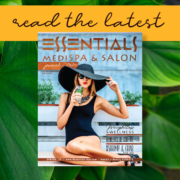 https://www.essentialsmedispaandsalon.com/wp-content/uploads/2018/08/logo-300x124.png 0 0 Nicole Eveleth https://www.essentialsmedispaandsalon.com/wp-content/uploads/2018/08/logo-300x124.png Nicole Eveleth2019-03-21 19:53:212019-03-28 15:10:19Is Laser Hair Removal Right for You? This new regeneration and rejuvenation technique is the cutting edge in medicine. We are now up and running and ready to treat our patients to this therapy. In a nutshell, MSCs are derived from the Placentas of newborn babies. All mothers are screened and consented, and the cells are grown in FDA approved labs in the USA. The cells are separated, and the best ones are called “golden cells,” these cells are treated with antimicrobials and are flash frozen to minus 350 degrees Celsius and shipped to us. Stem cells are being used in all types of disease processes, and various disciplines have found they hold great promise for their patients. Groundbreaking results have been seen in the debilitating illness of the central nervous system that was formerly considered irreversible or untreatable. Treatment of Joint disease and pain have become common, applied to wellness and anti-aging medicine the results have been no less amazing, aging does not have to be a slow degenerative unstoppable process, the years come, but the degeneration can be mitigated. I heard Stem Cells are fetal tissue, is this true? Some common misconceptions about stem cell are the idea the fetal tissue is used. This is not true, that is an entirely different line of cells. Fetal cells have been implicated in causing tumor growth in one case in Russia. We do not use Fetal cells, they are derived from aborted human fetuses, and federal law is stringent on this practice. We do not use any Fetal tissue and are not involved in those practices. Here at Essentials Medispa we utilize ethical, informed consented and voluntarily donated placental-derived stem cells exclusively. This is cutting edge science, and I will be catching everyone up on the latest studies and some more of the SC 101 basics. Imagine living cells designed to heal us with the ability to replicate or repair any tissue in the human body, given like a medication…science fiction no more. In the early part of the 21 century, the controversy of using embryonic cells or Human fetal cells reached all the way to the presidency and federal lawmakers. A ban was instated for the use of these tissues and thus was codified into U.S. statutes. This cast a justifiable ethical cloud on these studies and a public perception problem, what was not widely known was Adult Stem cells were already known to be safer and more powerful. It was slightly later that the not so well known, MSCs stem cells (Mesenchymal) could be derived from the Placentas of healthy newborn babies. These cells are so potent and robust that they are considered to be the cell of choice, exceeding adult stem cells in all parameters of anti-inflammation and regeneration. This understanding and over 50,000 cases worldwide without issue has solved the ethical and legal problems for us in this field. The use of placental umbilical cord MSCs is ethical with healthy volunteer donors who are consented and medically screened. The FDA has oversight of all the laboratories in the USA. We adhere to this ethical practice model and agree that adherence to the safe and morally sound collection of MSCs from placentas was the right way to go. The use of this naturopathic cellular “medicine” is at the cutting edge of science, and we want to share this with our patients. We also have moral and ethical principles instilled in us healers in our oath ell “do no harm.” We all share feeling that what we do is good for humanity and will lead us to breakthroughs and life-sustaining treatments. In this regard our consciences are clear, and we can sleep at night, knowing our oaths are upheld. Essentials Medispa strives to be a destination for wellness in Viera Florida. Brian Whaley ARNP -BC has brought his expertise in Regenerative medicine to our community with the latest safest, and most useful stem cells therapies from FDA approved sources. Today we discuss aging, and the role stem cells play in aging. Frailty as a consequence of aging is a significant health concern. Today rather than being an inevitable outcome in the elderly, frailty has been pre-supposed as a medical condition. Frailty is defined as a clinical syndrome with three or more of the following criteria: Unintended weight loss, self-reported exhaustion, weakness, slow walking speed, low physical activity and loss of muscle mass. One cause for frailty is the decrease in the number and robustness of these cells, each person has a finite number. Like a bank account we withdraw as we need, and as in real life some are born rich, and some are born poor. In this regard, you may know someone who is 80 and looks 60 or maybe even vise versa. The lifestyle and endowment both impact our longevity and youthfulness. The fountain of youth seems to already be in us, but we use it up or by hard lifestyles overuse them, in any case, once the degeneration vs. regeneration ratio is inverse we spiral into frailty unless supplemented or rehabilitated. The aging stem cells we carry slow down as well, they do not divide quickly and are merely aging along with us. Once nearly depleted the only choice is a fresh supply. It is posited that most over 50 are on the way to frailty. The MSCs we obtain here at Essentials Medispa are of the highest quality, youngest and most potent available. In the placenta the new MSCs will divide every 24 hours, by age 35 division is every 48 hours and at 65 years every 60 hours division. That equates to a 30 day tally of 1 billion, 32,000 or 200 cells available respectively to each age. It is clear that these “Baby” stem cells are far far superior. This new supply is abundant in the secretion of trophic factors and demonstrated an effect on anti-inflammatory processes. Current studies at The University of Miami has shown that patients treated with MSCs are able to return to more independent lifestyles and activities of daily living. In the younger frailty group increase in muscle mass and strength was demonstrated and overall feeling of wellbeing, with renewed interest in social activities, exercise, and increased libido. The use in athletes for recovery has also made strides in this approach to healing, but that will be in the next installment. I am Brian Whaley, and I am available for a free consultation here at Essentials Medispa located here in Viera Florida.